New for 2018 the EBCO UCL-20 is an affordable, reliable quality e-bike for the leisure rider or everyday commutes. Powered by the tried and tested TranzX e-power support system comprising of the new F-15 Font hub motor delivering a quieter Hi-torque performance teamed with a RPM pedal rotation sensor and motor controller and featuring CanBus Logix Computer diagnostic capability which gives more efficient and accurate information for your EBCO service dealer. 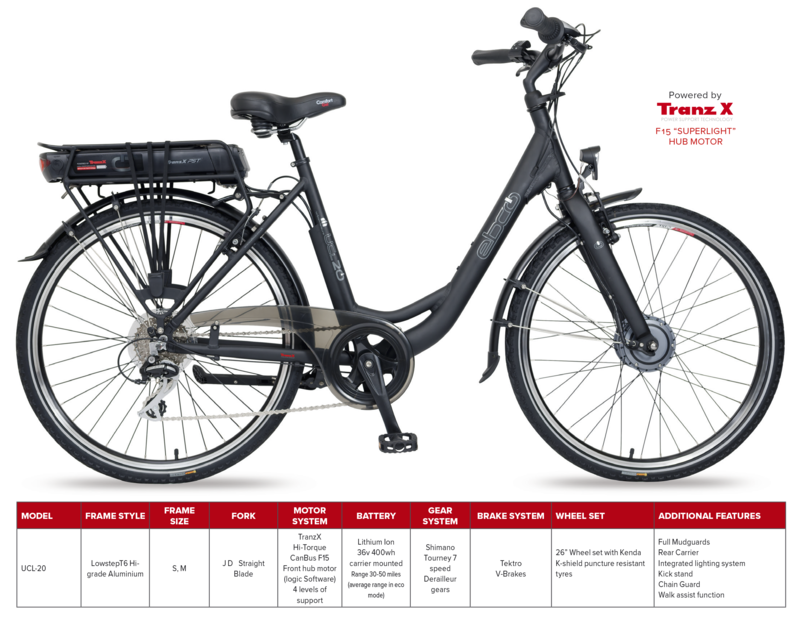 Supported by a 400wh Lithium ion battery that will take you through 30 to 50 miles of enjoyable e-bike riding between charges, a Shimano 7 speed gears system, Integrated lighting system, rear rack and full mudguards complete the package. Available in Low step frame style (that makes getting on and off much easier) with a comfortable riding position Sizes:- S.M. and finished in Matt Carbon Black. Qualifying for the government tax efficient cycle to work scheme.